By Amatullah Abdullah (edited by IslamReligion.com) : Beloved Prophet Muhammad, may the mercy and blessings of God be upon him, was born in Mecca, Saudi Arabia circa 570 C.E. He is an example for all of humanity. He was a remarkable man at all times. He excelled in all walks of life by being a prophet, ruler, orator, soldier, husband, friend, father, uncle, nephew, and a grandfather. He was a man of love, patience, courage, wisdom, generosity, intelligence and magnitude who inspired millions of lives throughout the world. God says in the Quran that he was sent as a mercy for the people of the world. His Prophetic Mission began at the age of forty, circa 610 C.E., and continued until 632 C.E. From the path of ignorance, mankind was lead to the straight path and was blessed with the guidance of God. Shortly before his death, Prophet Muhammad delivered a sermon during the Hajj, which came to be known as his “Final Sermon”. This final sermon was not only a reminder to his followers, but also an important admonition. The final sermon confirms the end of his Prophetic Mission. Year 10 A.H. of the Islamic Calendar is considered to be one of the most significant years for three reasons. Firstly, this was the year when the Prophet delivered his Last Sermon during his farewell pilgrimage to Mecca. Secondly, this was the year where a number of deputations came to the Prophet to announce their Islam as well as their tribes. Thirdly, it was the golden period of Islam when multitudes of people embraced the faith by accepting the message of the Prophet. 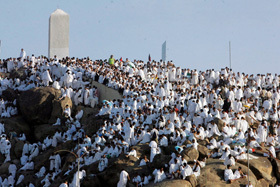 Prophet Muhammad undertook his farewell pilgrimage in the year 10 A.H. His farewell pilgrimage to Mecca is one of the most significant historical events in the minds of Muslims, for it was the first and last pilgrimage made by Prophet Muhammad, as well as being the model for performing the fifth pillar of Islam, the Hajj. Prophet Muhammad’s final sermon was delivered during the Hajj of the year 632 C.E., the ninth day of Dhul Hijjah, the 12th month of the lunar year, at Arafat, the most blessed day of the year. There were countless Muslims present with the Prophet during his last pilgrimage when he delivered his last Sermon. O People, it is true that you have certain rights with regard to your women, but they also have rights over you. Remember that you have taken them as your wives only under a trust from God and with His permission. If they abide by your right then to them belongs the right to be fed and clothed in kindness. Do treat your women well and be kind to them for they are your partners and committed helpers. And it is your right that they do not makefriends with any one of whom you do not approve, as well as never to be unchaste. All mankind is from Adam and Eve. An Arab has no superiority over a non-Arab, nor does a non-Arab have any superiority over an Arab; a white has no superiority over a black, nor does a black have any superiority over a white; [none have superiority over another] except by piety and good action. Learn that every Muslim is a brother to every Muslim and that the Muslims constitute one brotherhood. Nothing shall be legitimate to a Muslim which belongs to a fellow Muslim unless it was given freely and willingly. Do not, therefore, do injustice to yourselves. Even today the Last Sermon of Prophet Muhammad is passed to every Muslim in every corner of the world through all possible means of communication. Muslims are reminded about it in mosques and in lectures. Indeed the meanings found in this sermon are indeed astounding, touching upon some of the most important rights God has over humanity, and humanity has over each other. Though the Prophet’s soul has left this world, his words are still living in our hearts.